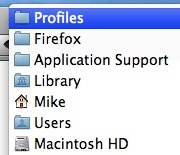 I, like many other Mac users, prefer to use Firefox over Safari. Safari is fast but the extensions in Firefox combined with better tab controls and preferences keep me from moving to Safari. For those who use Safari it’s easy for you to move bookmarks from one Mac to another but for Firefox users you either need to install an extension or copy your Firefox profile to the other Mac (you can also copy your profile to a Linux or Windows computer but for now I’ll focus on OS X). The steps are pretty simple, you will only need a working copy of Firefox on both Macs and a way to copy the files between computers (e.g. a USB thumb drive, a CD-R, or a folder shared over your home network), I’m going to use a thumb drive. The next time you open Firefox all of your extensions, themes, bookmarks, preferences, and saved passwords should be on the second Mac. I do this every few months when my MacBook’s Firefox install falls behind my iMac’s in terms of saved passwords and bookmarks. This helps me keep both computers Firefox environments identical making for a much better experience when I don’t have access to my iMac and I can’t remember the password to that new website I signed up for a few months ago and haven’t logged in since then. Like I said above, I know that there are extensions that will let me do this same thing but most (if not all) of them require me to sync all of my bookmarks and saved passwords to a 3rd party server, not exactly the mose secure option out there, I’d rather my login credentials not be located on yet another companies server.